This is a 1:25,000 scale map (defence overprint) of the region of Geldern, Eastern Holland. 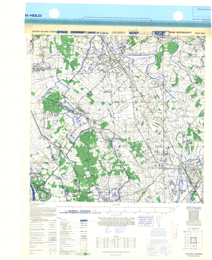 It is the third edition of this map, published on February 6, 1945 by the Army Map Service of the United States Armed Forces. Production information for the base map is 10M/1/45/3RCE/5557. Production information for the overprint is 5M/2/45/3RCE/5611.